The National Chairman of the Peoples Democratic Party (PDP), Uche Secondus, has called on the Chairman of the Independent National Electoral Commission (INEC), Professor Mahmood Yakubu, to end the pattern of inconclusive elections and conclude that of Rivers and Bauchi State. 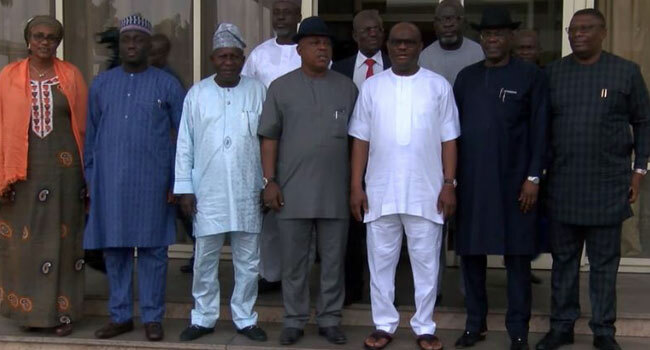 Secondus who led the National Working Committee of the PDP, during a courtesy visit to Rivers State Governor, Nyesom Wike, urged the electoral body not to cause a crisis with the maneuvering of results. “I call on the chairman INEC Professor Mahmood Yakubu not to set this country into crisis because of inconclusive elections. It has never happened in the history of our country. However, Rivers State Governor, Nyesom Wike, alleged that some persons in the state are making attempts to stop the process of result collation by INEC. “Attempts have been made to stop collation as announced by INEC. This morning the political parties that contested the elections with us, have all gone to court to seek for stopping of collation. But the court did not grant them. “But we prefer the move because it is the due process. The pain is the antics by security agencies trying to intimidate collation and electoral officers, inviting them for one offence of the other so as to impede on the collation of results.